Proper care is obviously essential for preserving the condition of an antique. However, careful maintenance of a vintage replica can help to ensure that a globe made in the 21st century survives to be an antique in the next. At BarGlobeWorld.com we not only want you to buy a bar globe from us, we want you to keep it for a long, long time. So below you’ll find a few tips that we wrote to help keep your floor globe bar, table top bar globe or globe bar serving cart looking like new (even if it’s old). Keep your globe out of direct sunlight. Prolonged exposure can fade the colors and print of the map, as well as darken and yellow the varnish applied over the paper gores. Do not use any abrasive or harsh detergents, as well as solutions with alcohol or solvents, while cleaning your globe. Avoid even using water if gentle cleaning with a dry, soft cloth will suffice. 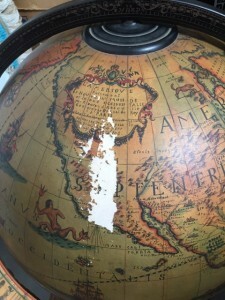 If any section of your globe is beginning to peel or already has, or if you see weak spots or surface damage on the shell, bring it to a professional conservator immediately. Keep your globe, especially an antique, in an environment where relative humidity and temperature do not fluctuate a great deal. Many materials used to craft vintage globes and replicas are sensitive to changes in climate. How Many People Can You Fit In a Globe?